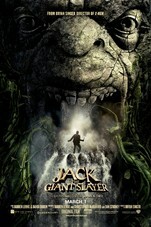 "Jack the Giant Killer" tells the story of an ancient war that is reignited when a young farmhand unwittingly opens a gateway between our world and a fearsome race of giants. Unleashed on the Earth for the first time in centuries, the giants strive to reclaim the land they once lost, forcing the young man, Jack, into the battle of his life to stop them. Fighting for a kingdom, its people, and the love of a brave princess, he comes face to face with the unstoppable warriors he thought only existed in legend--and gets the chance to become a legend himself. The script sets up the situation and characters nicely, and the actors are terrific. Although it often feels there's more of mechanics than the muse keeping Jack the Giant Slayer going, this sprightly fairy tale reworking is full of beans, smartly written and packs plenty of fun. While it's fine for a director to explore his childhood inspirations, you hope he would bring something a bit more personal to it. "Jack" seems designed to appeal to a very narrow, and possibly illusory, demographic: the mature moppet.